I'm reading the most charming book I've read this year. If I hadn't worked yesterday, I could have finished Katarina Bivald's The Readers of Broken Wheel Recommend. It's about books and a bookstore and a stranger who helps to build a community. Love it, love it. And, I can't wait to finish it, and actually tell you more about it. So, what have you read lately that you loved? Yes, I loved Nora Roberts' Irish Born series, but, oh, this book is special. Have you read something you loved lately? And, if not, just tell us what you're reading, please. I'm re-reading Ross Macdonald's BLACK MONEY. I love Macdonald's work. He's one of the greats. I loved Sweet Pepper Hero by J.J. Cook. Right now I'm reading a book about a biologist who studies Arctic wolves, Never Cry Wolf by Farley Mowat. My reading is still way off. I'm recovering from being sick but now Jackie is sick. I just haven't been able to concentrate on longer works. I'm reading short stories by Heath Lowrance on the Kindle: DIG TEN GRAVES. Also reading SHOTGUN WEDDING by Susan Rogers Cooper in her Sheriff Milt Kovak series. This series has always seemed an Oklahoma version of Bill Crider's Sheriff Dan Rhodes series, only told in the first person. This is the ninth in the series (from 2009) and there are a couple more since then. But you need to read them in order, starting with THE MAN IN THE GREEN CHEVY and, my favorite title, HOUSTON IN THE REARVIEW MIRROR. I actually have time to read these in the morning, snow delay. Thank you, Bill. It's always interesting to see what you're reading. Sandy, I'm glad you liked Sweet Pepper Hero as much as I did! Hope you enjoy Never Cry Wolf. Jeff, I'm just going to send wishes for better health to you and Jackie. I hope you're both feeling better. 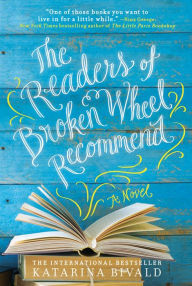 Lesa, I'm reading The Readers of Broken Wheel Recommend as well, and enjoying it. So far this year, my "loves" have been all over the map: Scent of Murder by James O. Born, Wouldn't It Be Deadly by D.E. Ireland, Carter and Lovecraft by Jonathan L. Howard, Outrageous Openness by Tosha Silver, Put a Ring on It by Beth Kendrick, The Gates of Evangeline by Hester Young, and The Necessary Murder of Nonie Blake by Terry Shames. It's been a good January! I'm currently reading The Branded Spy Murders by Van Wyck Mason. Fifth in the Hugh North series, which is a bizarre melding of the mystery and espionage genres. Also reading The Burglar Who Liked To Quote Kipling by Lawrence Block. I keep hoping he'll write a new entry in the series. The Burglar Who Counted the Spoons (2014) was the first new one in 10 years. It's so wonderful to read about the books you're all reading and loving. And, Jeff, I'm so glad you check back on the comments during the day, and give some additional info. Thank you! I've finally made it back to Charlie and Diesel with Classified as Murder by "Miranda" James. I finished A Man Called Ove by Fredrik Backman and loved it. Currently I am reading Murder Most Malicious by Alyssa Maxwell. An upstairs downstairs cozy ala Downton Abbey. Not far enough into to it to make a decision but there is a large list of characters introduced in the first chapter that I am having a hard time remembering now that they are being reintroduced.